I should have eaten this right away...but alas, I stored it in the fridge overnight. Let's just say, this is one of those dishes best eaten as soon as possible. 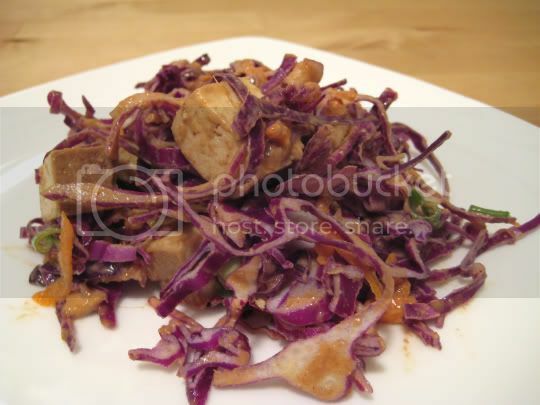 Red cabbage is combined with cubes of baked tofu (I used Thai-flavored), shredded carrots, and green onions. Simple, crunchy, flavorful, good. The dressing is a pureed combination of peanut butter, fresh ginger, garlic, soy sauce, bron sugar, and apple cider vinegar. This turned out to be very thick and very peanut butter-y. What was missing from this dressing. Lime juice, definitely. It could have cut down some of the richness and added a nice zing. Toss the slaw mix with the dressing, and you've got [what should have been] a yummy, Asian-style, quick and easy side dish. But DO NOT eat leftovers of this. The cabbage gets heavy, thick, and soggy, and the dressing gets thick, goopy, and pungent. Trust me, the leftovers did not look anywhere near as appetizing as the picture looks. In fact, it looked a little like purple and brown mush. And the smell of the dressing was no longer fragrant and savory, but un-fresh and smelly. Make again? After this bad experience, I doubt it. I'd rather have something a little lighter anyway, at least as far as the dressing goes.